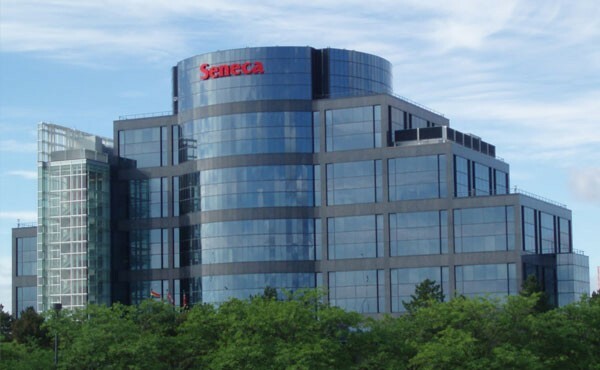 Seneca College of Applied Arts and Technology is one of the most famous public college with hands on learning institute in Toronto, Ontario, Canada. It offers full-time and part-time programs at the, diploma, certificate and graduate levels in a dynamic environment .We are proud in creating the vibrant environment for learning. We focus on learner’s success program and service excellence, connection to community, sustainability and innovation. Seneca offers more than an education. The campus diversity gives students the advantage of partnerships with industry leaders, the latest in hands-on computer technology, a variety of class sizes, and full-time, part-time and continuing education options. We provide a transparent and accessible education, so Seneca also employs various methods of teaching from in-class lectures and online learning to co-op and field placements – in programs related to applied arts, business, financial services and technology. We offer degrees, diplomas and certificates renowned for their quality and respected by employers. Combining the highest academic standards with practical, hands-on learning, expert teaching faculty and the latest technology ensures Seneca graduates are career-ready. Our values describe Senecan’s at our very best. They connect us, underpin the work we do, and the way we interact with each other and the world.